The Bend’s Old Mill District Getaway is a five-bedroom, three-bath vacation rental that sleeps 10-12 people on the southwest side of Bend. 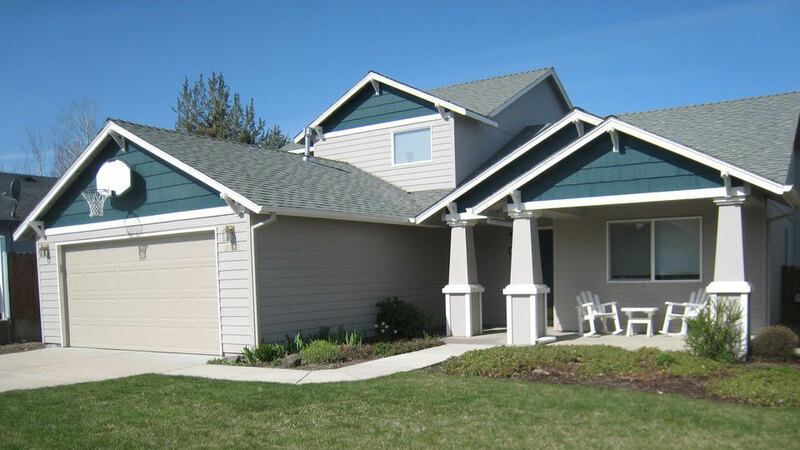 The location is a few minutes to downtown Bend with easy access to Mt. Bachelor skiing, kayaking on the Deschutes River, hiking and mountain biking trails, fly fishing in mountain lakes, and shopping in both the Old Mill District and the Bend Factory Stores. The bright, spacious and airy 2,144 square foot, two-story property has views of the Cascade Mountains, with front and back porches, a great room, a gas range, and a large dining table by the gas fireplace. The kitchen is fully stocked with cooking supplies and has both covered parking and a garage, as well as a washer and dryer and wi-fi. Children are welcome but pets are not allowed. Guests comment that the house feels spacious and quiet, and they appreciated the large dining table which suited gatherings of everyone in the house.